Getting a pay raise while sitting on the couch? Sign me up! Thanks Visa for the dividend increase! Earlier this week the Board of Directors at Visa, Inc. (V) announced yet another hefty increase to their dividend payment. The quarterly payout was increased to $0.195 from $0.165. That's a whopping 18.2% pay raise! Visa is a Dividend Challenger with 9 consecutive years of dividend growth. Shares currently yield 0.73% based on the new annualized payout. Since I own 38.263 shares of Visa in my FI Portfolio this raise increased my forward 12-month dividends by $4.59. This is the 5th dividend increase I've received from Visa since initiating a position in 2012. Through organic dividend growth alone Visa has increased my annual dividend payments by 136% cumulatively. According to US Inflation Calculator the cumulative rate of inflation over that same time is just 7.5%. Talk about outpacing inflation. 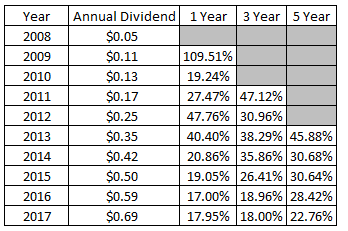 Visa might not have the longest dividend growth streak or the highest yield, but what they lack in both of those departments they more than make up for with dividend growth. My forward dividends increased by $4.59 with me doing nothing. That's right, absolutely nothing to contribute to their operations. Based on my portfolio's current yield of 2.85% this raise is like I invested an extra $160 in capital. Except that I didn't! One of the companies I own just decided to send more cash my way. Thus far in 2017 I've received 40 dividend increases from 33 companies held in my FI Portfolio increasing my forward 12-month dividends by a combined $244.56. My FI Portfolio's forward-12 month dividends increased to $5,851.81. Including my FolioFirst portfolio's forward dividends of $74.80 brings my total taxable accounts dividends to $5,926.61. My Roth IRA's forward 12-month dividends are at $317.26. Do you own shares of Visa? 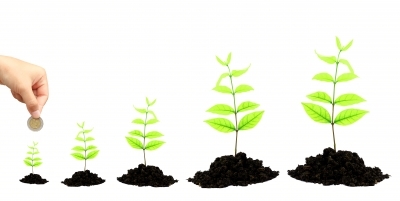 Have you been happy with your dividend growth in 2017? Thanks for posting, I LOVE Visa. Easy to understand, wide moat, no debt, they are a financial toll system. It's my second largest holding after MO right now. Keep up the good work! Heck yah, love owning Visa that's for sure : ) Keep those dividend increases coming!